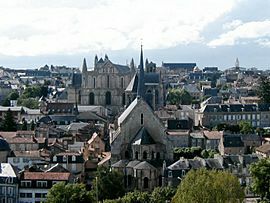 Poitiers is a city in France, the prefecture of the Poitou-Charentes region and the Vienne department. The town is picturesque; and its streets are interesting for their remains of ancient architecture, especially of the Romanesque period, and the memories of great historical events. The city itself is very old. It already existed as a Gaulish fort in the time when Julius Caesar came to Gaul. It was the capital of the Pictones tribe. Poitiers Facts for Kids. Kiddle Encyclopedia.